These mechanisms use a "reaction wheel" that moves the object against any tipping action by rotating in the opposite direction. This is using the concept of conservation of angular momentum: wheel spins one way, object spins the other way to conserve angular momentum. So, the whole system moves against any tipping caused by external forces or inefficiencies. The bikes have a reaction wheel mounted perpendicular to the main bike wheels. This first bike is from an Asian Youtube user and is a miniature bike. He also has a unicycle that moves forwards and backwards to stabilize in that direction, whereas a perpendicular reaction wheel stabilizes side to side motion. This robot is from a how-to on Let's Make Robots by Frits Lyneborg. It is a simple walker that has a nice design. Often walking robots can be quite complex. 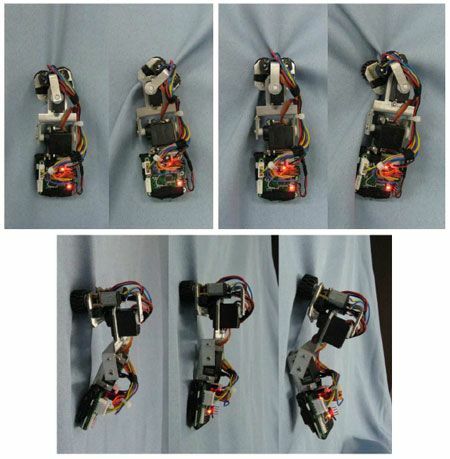 There are three servo motors: two for the feet and one at the hips that shifts the weight and position of the legs. There is a four bar linkage in the "leg area" that lifts one leg up at a time. The side bars are the legs, which also hold the servos for the feet. The upper, normally horizontal bar has a high stick with the battery pack, so that when bar is slanted the weight is tipped to one side, which helps the walking movement. While standing on one foot, the foot servo rotates so that the body swings forward. The basic idea is like when you "walk" a large object, like a big board or piece of plywood, by tipping it a little on a corner and swinging the other corner forward, then repeat by alternating the corners. The creator also uses paint mixing sticks and hot glue, which is simple and works great. He hot glues symmetrical pieces together so that any drilled holes will line up exactly. Then he cracks them apart. The microcontroller is just a simple Picaxe. This is a landing page for my alarm clock project. There are three posts on this project, so I though it would be helpful to have one overview page that I can direct people to. I have a cheap plastic alarm clock that had small buttons, specifically the alarm off button. So I wanted to replace them and mount bigger buttons (I added a big snooze button too). I used Adafruit's small and simple arcade buttons (which I've described in this informative post, in case you want to know about them for your project) and wired them to the button contacts on the inside. I took out the CD player to make room for the buttons cut holes in the top to mount them. It turned out great in the end. I saw a classmate recognize this in class once and he was showing it to our Physics teacher. Hold a piece of paper in your hand on the side like you're grabbing a plate or the side of a tray and curve it using your fingers and thumb on either side of the paper. Then drop something on the other end of the paper. If you orient the paper concave up, the object will be caught inside the scoop shape. If you orient the paper concave down, the object will collapse the arch shape and drop past the paper onto the table. ...lets the object fall past as the paper bends. Usually the object slides down one of the sides of the arch too, so you'd have to account for that in a practical application. This reminds me of a flip-flop, valve, or flap, such as the ones seen in sorting machines or marble machines. You could make this with a material that is a little more stiff and predictable, like rubber or a flexible plastic. The flap could be rotated with a motor or a rotating pneumatic actuator. It could be angled so that when an object gets caught on the concave up side it slides down and away like in a channel. However, the same actuator that rotates the flap can be used to direct objects much more simply. The two-way action could be done with a stiff, spring loaded flap that is kept from moving one way with a stopper or ledge, like a door jam, and able to freely open in the other direction. So this flap design must be uniquely beneficial for the resources of an actuator to be used up in this way. One beneficial example I've thought of (which doesn't even require an actuator) is a door into a container that keeps objects from getting out (concave up side faces inside container), but lets objects in (concave down side faces out). This container could be vibrating or tumbling the objects inside, so a one-way opening is needed. The container might be naturally round, like a tire, so this concave flap could be built into its geometry, instead of being an abnormality like a square or circular door. Search sorting machine on Youtube, or Lego sorting machine. The original article is very good at describing the situation and solution to making metals that are less like hard, orderly crystals and more like grainy, moldable, "amorphous" materials like glass and plastic. The method involves cooling the metal quickly enough so that its molecules don't have enough time to settle down in an orderly configuration and must "freeze" where they are. However, this is practically impossible with pure metals since they have all the same atoms and are extremely orderly to begin with. You can't remove heat fast enough. So alloys are made where the mixture of atoms has a distribution of sizes that do not settle easily. The first alloy was created in the lab in 1960, from three atoms of silver for each atom of silicon. However, "elaborate means were required to cool the samples fast enough, and they had to be small and thin—wires, ribbons, or foils less than 100 micrometers thick." In the 1990s, researchers at CalTech made a better alloy with a lower "critical cooling rate." The first commercial amorphous metal alloy was brought to market in 2003 by CalTech spin-off Liquidmetal Technologies. Called Vitreloy 1, it’s about 40% zirconium, 20% berylium, and 10% each of titanium, copper, and nickel. Vitreloy 1 and its successors have a number of exceptional properties. They are strong, hard, and (unlike crystalline metals) they do not shrink appreciably on freezing, and thus can be injection-molded, blow-molded, and otherwise formed using the same economical processes as plastics. Designing tooling for amorphous metals requires paying attention to the critical cooling rate of the material; if some volume of the part cools too slowly, the alloy there will crystallize, shrink, and spoil it. Again, read the original article, it has the best information there.